Architectural Feature Wall: Stainless Steel & Rust Pair Beautifully | Grunau Company, Inc. When a local manufacturer wanted to erect an architectural feature wall, they turned to Grunau Metals. 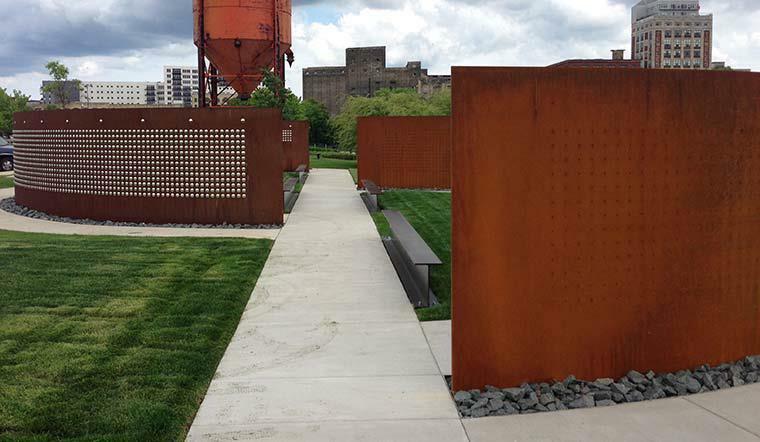 With our unique knowledge and experience in specialty metals, Grunau Metals constructed an outdoor feature wall using COR-TEN material, also known as weathering steel. This type of material will develop a protective coat of rust when exposed to the elements over time, thus eliminating the need for painting. The new feature walls join two others on the grounds of one of the manufacturer’s facilities. Over the course of the next few years, the protective “rust” layer will regenerate continuously while exposed to the elements. In other words, the steel is left to rust. This rust not only forms the protective coating, but also creates an interesting outdoor sculpture. If you’re considering using an exotic or specialty metal as an architectural element, contact Grunau Metals today!